Happy Birthday to ME! Husband gifted me with a Compost Aerator from Johnny’s Selected Seeds. 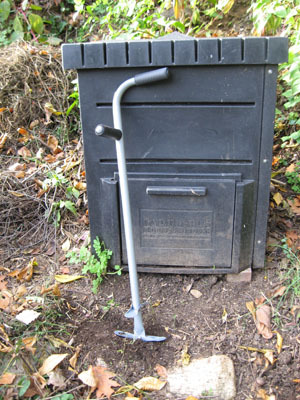 The Compost Aerator in foreground, and the Compost Bin, from Gardener's Supply, in the modest background. 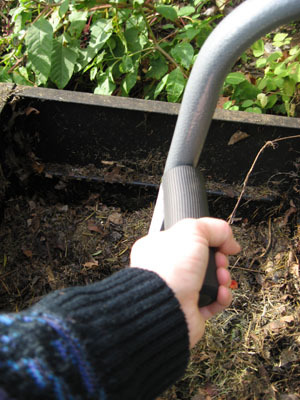 Notice the thoughtfully-clad handles in black ribbed rubber, giving a good grip — a grip that can be assembled for either right- or left-handed gardeners. Once the aerator is well-down into the heap, you use your two hands-on-the-handles to turn the tool 90- or 180-degrees (depending on how enthusiastic you are feeling) and lift up. This photo illustrates a Novice's 90-degree turn. Then you lift up. As you lift, the phalanges flair (Alliteration is an ailment for Amy), and fluff the compost. 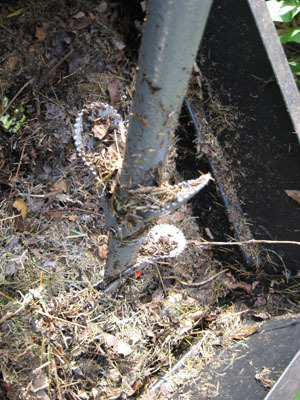 And, ta da!, the compost is aerated! Hence, the name of the tool…. Look at the beautiful stuff on the wings of this tool! And repeat until done. Or, until mixed to your satisfaction. Air = optimum environment for microbes. 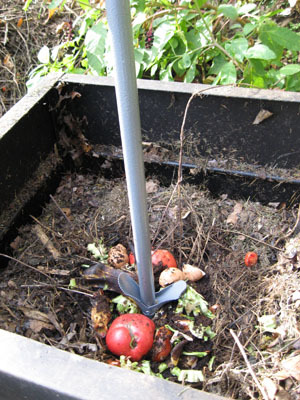 And when the microbes are happy, composting occurs. And when THAT happens, Amy the Gardener is really really happy. What a wonderful birthday gift! And cheers to you! This apparatus works particularly well when situated near the garden! I agree — tools are the BEST! And thank you for the good wishes, Sue!